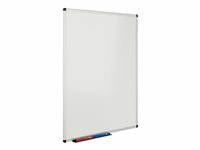 Double sided drywipe whiteboard which offers one side plain ultrasmooth surface with gridded Guideline surface on the other. Aluminium framed whiteboards available in a wide range of sizes. The Guideline side has a feint 20mm square grid that assists the presenter, but is unseen by the audience. Supplied with pen tray and concealed through the corner wall fixings. For use with drywipe pens. Can be mounted landscape or portrait. Please allow 2-3 working days on sizes up to 1200x1200mm and 4-7 working days on larger sizes.